Being an ardent Russophile, Tom Bullough’s Konstantin caught my eye on the virtual bookshelves. It’s a piece of biographical fiction, and recounts the early years of Konstantin Tsiolkovsky, the man regarded as the founding father of Soviet space travel. His is not a name I was familiar with before picking up this book and I can’t say that I’m much the wiser as to his legacy having read Konstantin but I found this a highly enjoyable read all the same. The story stops short of describing Tsiolkovsky’s real achievements and focuses instead on the making of the man. The story starts in the 1860s when young Kostya (the diminutive of Konstantin) and his family are living in Ryazan, a town some 200 kilometres from Moscow. After falling ill with scarlet fever, Kolya becomes partially deaf, an event that see the already bright and curious boy become more introspective; spending increasingly more time on his own, Kostya spends his time investigating how things work, even designing and making his own ear trumpet. Although Bullough tells the story in chronological fashion, it’s done through a series of ‘scenes’ rather than a flowing narrative and within each one there’s another piece of evidence that points the way to what Konstantin will become. This works well in the early part of the novel: there’s something captivating about this intelligent boy and the struggle he has to reconcile his big ideas with what he physically achieve. However, as time goes on and Konstantin’s ideas become theories that he develops and researches, these hints become more of a source of frustration; it’s obvious that these are well chosen references to Tsiolkovsky’s later work but in the book they introduced but never followed to their conclusion, and from the point of view of someone who isn’t familiar with Tsiolkovsky’s work, it leaves the story irritatingly lacking. It’s clear though that what Bullough has created is a fleshed out account of the childhood and formative years of a man who achieved much, and how he got to that point. Young Kostya is hugely likeable and his enthusiasm is infectious. Rather than precocious and wise beyond his years, he’s portrayed as a naturally gifted and inquisitive boy and this only makes him more endearing. Most of Tsiolkovsky’s scientific work goes way over my head though I find the history around the first real possibilities of space travel fascinating; later in the book when Konstantin becomes a teacher, the author goes rather too far into the details of astrophysics for the average reader. It’s not unfathomable but it strays too far from the narration. However, for the most part I really like the way that Burroughs has opted to show how a young boy became the man now hailed by many as a genius, a device that allows the reader to appreciate how truly remarkable the man really was. This thing I love most about this book is how Russian it sounds. Obviously the settings and names play a big part in that but stylistically there’s a strong sense of the Russian classics in the dialogue and structure. While the narrative might be lacking, Burroughs descriptive writing is a joy. Whether it’s in capturing the biting iciness of a Russian winter or describing the gruesome symptoms of poor Kostya’s illness, Burroughs’s colourful writing is highly evocative. Best of all, in my opinion, is the scene in which Kostya, travelling with his mother and siblings to join his father in Vyatka (the city now referred to as Kirov), is permitted to join the coach driver; at Kostya’s insistence the coachman urges the horses faster and faster, a real heart in the mouth thrilling sequence. The meeting of the old traditions and customs of Russia – many still closely observed today even by younger Russians – with new ways of thinking forms an interesting aspect of the book. Kostya’s mother takes the boy to visit the icon of St. Nikolai in the hope that it will cure his deafness; it’s a difficult journey for the boy who had been so terribly sick but so strong is his mother’s faith that they make the pilgrimage anyway. This contrasts beautifully with Kostya’s growing desire to question and to seek proof. Bullough’s story ends long before Konstantin’s so the story does not end conveniently. Bullough tries to resolve this partly by resorting to the clumsy digression on astrophysics and partly by finally taking the reader to 1965 and the occasion of the first space-walk by Soviet cosmonauts. It’s a compromise that works fairly well and Bullough should get credit for not feeling pressured to take the story to a more obvious conclusion. 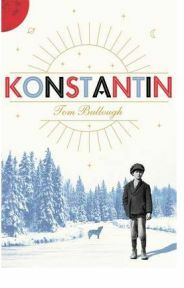 I loved Konstantin; it seems almost impossible that a contemporary British author could have produced something so wonderfully Russian in style and essence but that is exactly what Bullough has done. This is a really inspiring novel centred on a fascinating and enchanting real life character. I can’t pretend not to have felt just a little disappointed not to have come away with more of a grasp of Tsiolkovsky’s legacy but nonetheless I was captivated by Bullough’s colourful tale. Thanks to the publisher fro sending the review copy.